Have you ever caught yourself grinding your teeth? While it may seem harmless, you could have bruxism. Clenching or grinding your teeth can happen when you don’t even notice it. Additionally, many people grind their teeth at night. This can lead to disrupted sleep, jaw pain, tooth damage, and more. Thankfully, your dentist in Danville knows the common symptoms of this disorder. Keep reading to learn more about bruxism and what your dentist can do to help. Bruxism is a condition that occurs when you grind or clench your teeth. If you have this condition, you may clench without even realizing it or grind your teeth while asleep. Most commonly, bruxism occurs during sleep. This is dangerous because you may not know that the clenching and grinding is even happening in the first place. Untreated bruxism can lead to jaw disorders, chronic headaches, damaged teeth, and other dental issues. Thankfully, bruxism can be treated to avoid some of the more severe symptoms and keep you healthy. Your dentist can custom-make nightguards to protect your teeth while you sleep. They will take an impression of your smile, and then fabricate a mouthguard that fits comfortably around your pearly whites. This can alleviate jaw pain, help you breathe better during sleep, and prevent side effects of bruxism like worn and sensitive teeth. Now that you know more about bruxism, have you noticed any of the symptoms above? If so, get in to see your dentist right away. They will carefully examine your mouth and provide the right treatment to give you a great looking and feeling grin. At Danville Dental Associates, we have a team of expert dentists with a passion for providing quality care. 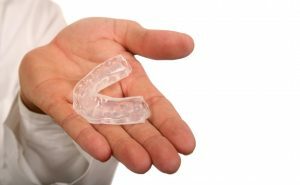 They take pride in offering custom-made mouthguards to give patients a good night’s sleep and protect their teeth. For any questions, they can be reached through their website or by phone at one of their 6 locations.